To celebrate the new look store and to say a massive thank you to my subscribers, I offer the following discount code which will get you 9% off your order. Why 9% I hear you ask!Well, my site was re-launched on 09/09/09, so the Voucher code is 9SEPT09! and this is valid until 30 November 2009. It can be entered on the shopping cart screen when you view your basket. Enjoy! 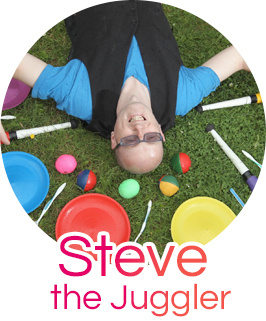 In issue 11, I wrote lots of ideas on how to improve your 3 ball juggling skills. Here are some more to try out! Body Moves If you are able to do any sort of gymnastics (forward rolls, somersault, pirouettes, cartwheels etc), then use these in your act! Throw a ball high THEN do your move, and then resume the juggling! If you try to throw the ball high whilst beginning to do your move, the ball could end up anywhere, so take your time and practice till your move looks smooth and you can achieve it at least 9 out of 10 times before thinking of adding it to your existing routines! Bounce Moves and Contact Juggling As well as exploring the throws between different parts of your body, you can try bouncing a ball off the top of your head, forehead, behind back (duck catch), off the front of knee and foot etc. Now try placing the ball on various parts of your body and letting it drop into a juggling pattern, such as on forehead or top of head, or under chin. Try rolling the ball down your legs and do a kickup, or along your arm as far as the elbow or all the way to the shoulder! Some of these moves are not easy, and the body rolls are actually a form of contact juggling, which you can read more about here – Contact Juggling Tricks page. Here are some useful pages if you are about to plan your CHRISTmas shopping or for making up your own wishlist! Gift Sets Page –A £10 gift set is worth £12, and a £20 gift set worth £25. You can pick 2-3 of the items to be included in this parcel, and if you let me know who you are buying for (eg boy aged 7yrs) then I can choose the rest of the items to complete the order. You could use the gift sets to gather together lots of stocking fillers for loved ones! View All Products – I have recently created a page which contains every product. This allows you to search by price if you perhaps have a certain budget in mind or are looking for a present for someone, or product name. You can view my online Jugglingworld store (UK only) here. Just to confirm that people can pay by credit/debit card or PAYPAL on the site, but I am also happy to receive cheques made payable to “Jugglingworld“. Thank you to the people who have already written some product reviews and ratings for the new Juggling store. If anyone else is able to add your own thoughts on the 295 products currently available in the store, then you need to register on the website (bottom of the left hand menu), and then login and go to the product you wish to review. If you intend to purchase any items from the store, then you will automatically receive login details once you have completed your order so you won’t need to register! Perhaps you could review the next product you purchase! It would be greatly appreciated for your help in this matter, as it will help other people in the build up to CHRISTmas see which products people rate highly! In my first year based in England I have nearly taken part in the same amount of events as I did on my most successful year in Scotland. A massive thank you to all those who have hired me and helped spread the word to make myself known. If you are planning your CHRISTmas events. I have however spent so much time trying to launch the new website, as well as find juggling work within local schools and Church organisations that I didn’t have time to find work at CHRISTmas Light Switch On’s, and entertaining the crowds at all sorts of Winter Events, so if you are planning any big occasions, please let me know as I may still be available!